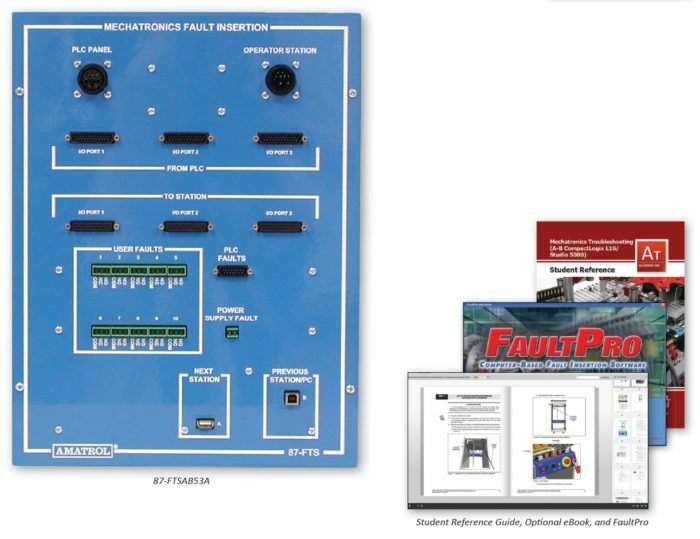 Amatrol’s Mechatronics Troubleshooting Learning System – CompactLogix L16 (87-FTSAB53A) – covers the troubleshooting of mechatronics stations and components by utilizing Amatrol’s world-class electronic fault troubleshooting software, FaultPro. Downtime caused by equipment problems can cost thousands of dollars per minute. For this reason, industrial maintenance technicians and operators must thoroughly understand the machines and components in his or her area and be able to act quickly as failures arise. The 87-FTSAB53A’s major components include a fault controller that provides up to 37 faults depending on which Mechatronics station is being used and Amatrol’s FaultPro USB 4.0 Mechatronics software with on-line student troubleshooting and record keeping. The 87-FTSAB53A requires a Mechatronics Learning System – AB CompactLogix L16 (870-AB53A), RSLogix 5000 PLC programming software, a computer, and at least one of the following Mechatronics stations: Pick and Place Feeding (87-MS1); Gauging (87-MS2); Orientation Processing (87-MS3); Sorting/Buffering (87-MS4); Servo Robotic Assembly (87-MS5-P2); Torque Assembly (87-MS6); Inventory Storage (87-MS7). The 87-FTSAB53A includes a fault controller, FaultPro 4.0 software, and cable set. Used in conjunction with the an 870-AB53A, at least one 87-MS mechatronics station, RSLogix 5000 programming software, and a computer, learners will use these components to practice real-world skills like testing a discrete input module, using a six-step sequence to troubleshoot a mechatronics station, and troubleshooting handshaking and permissive faults. The 87-FTSAB53A utilizes Amatrol’s FaultPro software, which allows instructors to instantly set and tailor faults to test a learner’s weaknesses and turn them into strengths. The skills developed by this software will allow learners to solve real-world technical problems once they’re in the fi eld. The 87-FTSAB53A allows training on 29 to 37 faults depending on what mechatronics stations it’s used with. The 85-FTSAB53A includes curriculum that covers a wide range of subjects for mechatronics faults, such as troubleshooting mechatronics inputs, outputs, power supplies, PLC processors, and overall system techniques. Specifically, learners will study topics such as the functions of PLC status and diagnostic indicators, how to force a controller input or output, the operation of the GSV instruction, and how to use a Sequence of Operation table to troubleshoot a mechatronics process. Optionally, this curriculum is available in an online eBook format. This eBook includes all of the content from the printed version, but provides an efficient online alternative with enhanced features such as keyword searches and zoom controls that enable a user to quickly locate and view information. The 87-FTSAB53A is just one in a large array of PLC options offered by Amatrol. Other Mechatronics options include: Human-Machine Interface (87-HMIAB53A); EtherNet (87-ENAB53A); PLC I/O Simulator (87-IOSAB53A); Barcode (87-BR1AB53A); RFID (87-RF1AB53A); and Vision Inspection (87-VS1). A sample copy of the Mechatronics Troubleshooting (AB CompactLogix L16 / Studio 5000) Student Reference Guide is also included with the system for your evaluation. Sourced from the system’s curriculum, the Student Reference Guide takes the entire series’ technical content contained in the learning objectives and combines them into one perfectly-bound book. Student Reference Guides supplement this course by providing a condensed, inexpensive reference tool that learners will find invaluable once they finish their training making it the perfect course takeaway.